Thermal Imaging Reports. Infrared (thermal imaging) is an advanced, non-invasive technology that allows the inspector to show clients things about their homes or buildings that can’t be revealed using conventional inspection methods. An IR camera can quickly and non-destructively detect areas of missing, moisture-laden or otherwise damaged insulation in walls, crawlspaces and attics or around doors, windows, electrical outlets and other access plates. All of these problems can increase a building’s energy costs by allowing cold air to enter the building and heated air to escape in the winter and the reverse in the warmer, summer months. 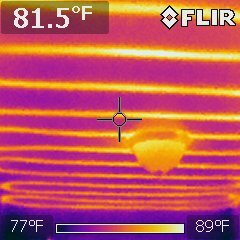 IR can also identify poorly insulated or uninsulated pipes, another source of costly heat loss. Infrared cameras are used to detect overloaded circuits, faulty wiring and loose electrical connections because they all generate heat. IR can detect thin spots in furnace heat exchangers and flues, mechanical problems such as worn, under-lubricated pumps, motors and bearings in fans, compressors and furnaces, electrical faults, refrigerant leaks and blockages in HVAC components. 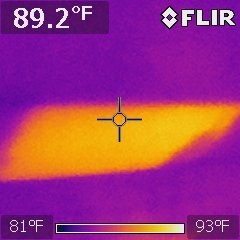 An infrared camera in the hands of a trained inspector can identify missing or moisture-soaked insulation under a flat roof membrane roof where the insulation needs replacement, permitting the surgical repair of failed areas rather than the more costly replacement of the entire roof. The increased use of EIFS (Exterior Insulation and Finish Systems) and stone, stucco, brick veneers and siding as facades on residential, as well as commercial, buildings invites the possibility of water intrusion if they are not properly installed. IR can detect or verify moisture infiltration in these weatherproofing ‘barrier’ systems, usually the result of insufficient detailing such as inadequate or improperly applied flashing or sealants. In addition, IR can monitor and track moisture migration paths within the wall cavity. IR covers so much more area and gets into many places not accessible to moisture meters, which require contact with the surface being inspected; it finds things that would never have been found with a moisture meter alone. But there is still a role for moisture meters. Infrared, which can quickly locate the probable presence of moisture by identifying temperature variations as slight as +/- 0.25° F in building structures, can’t detect moisture per se or how much is present. For that, you still need a moisture meter to identify an abnormality you might see on an IR thermogram, and to confirm that the temperature differential you’re seeing is actually an indication of moisture and not something else, such as an insulation void or multiple layers of building material. In addition, thermal imagers show all types of differences in temperatures. An air leak (infiltration) and water can look virtually the same in the infrared image. Moisture meters are the better instruments to make the final determination. savings for the building owner, or homeowner or other responsible party.